The church of Santa Maria of Rivotorto, famous as the "Sanctuary of Rivotorto", is located in the homonymous village, a few kilometres south of the city of Santa Maria degli Angeli. The edifice, nowadays under the care of the Order of the "Frati Minori Conventuali" (Convent of the Minor Friars), was born with the aim of preserving the structures of the Sacred Tugurio, which is the place where San Francesco gathered together his followers before he obtained from the Order of the Benedictine Monks the ownership of the Porziuncola. The actual building in neo gothic style, built after the earthquake of 1854 after Christ that destroyed the church dating from the 16th century, is made of three bays one can reach through three doors. 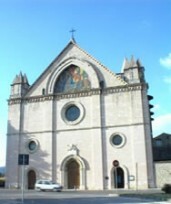 The façade is decorated with the representation of the miracle that the story says happened in theses places: San Francesco, in fact, would have appeared on a carriage of fire that was flying above Rivotorto when in reality he was in Assisi waiting for an audience of the Bishop Guido II. Inside, in addition to the suggestive view of the Tugurio, one can admire twelve paintings dating back to the 17th century, painted by Cesare Permei, representing some moments of the life of San Francesco during the period he spent in Rivotorto.